As a child, Uncle Tan was inspired by his mother who offered herbal remedies from her garden to neighbours and family members. At 13, he was further impressed by a qigong master's accounts of how herbs could save lives. Thus began his lifelong quest to learn about the amazing gifts of nature. His jobs in fishing and later in a shipyard gave him the opportunity to travel to countries like India, Taiwan and other parts of Southeast Asia. On his travels, he collected plants and took particular note of how locals maintain their health and treat ailments, especially those with limited financial resources. He asked many questions and tried out what he learned when he came back home. He is also widely read but carefully verifies with several reliable sources before experimenting with a herb or remedy. To transform barren space into fertile land (while holding a full-time job as a condo gardener) is back-breaking work. To finally see some harvest in his Choa Chu Kang plot only to have that taken away -- most people would have given up. But Uncle Tan repeated his efforts in a garden in Dempsey Road, only to lose it all again. He gritted his teeth and decided to start again. In 2005, he finally obtained approval to start a community garden in Jurong West where he lives. Despite the fact that there was nothing but bare ground, and no water source, he was overjoyed as it finally became more convenient for members of the community to get herbs and help from him. He quit his job and started bringing soil to the barren land, one wheelbarrow at a time. People moved by his passion and determination began to offer their help. To solve the water problem, Uncle Tan arranged to have water supplied by hosepipe to the garden from a unit several floors above. Months later, when he was offering his usual help to a passer-by, it turned out that she was able to reciprocate by helping him install water pipes. Gradually, the garden took shape with more than 300 medicinal plants, all cultivated without the use of chemical pesticide or fertiliser. Instead, the garden thrives on Uncle's organic fertilisers, such as charcoal ash and fermented plant waste. To meet the increasing demand for herbs, Uncle Tan sought and found a plot in Kranji. While he was very pleased with the scale and growing conditions, it called for punishing hours of hard work in the blazing sun. Most challenging was the uncertainty of the lease arrangement. But for now he just digs in his heels and tries to help as many people as possible, for as long as he can. Apart from inspiring several community groups to start their herb gardens, Uncle Tan is also a founding member of NTU Herb Garden and continues to give educational talks at the garden. The NTU garden was started in 2009 by Mr Ng, a technician who was working in NTU. Despite the many challenges faced (and which the garden continues to face), it is today a thriving healing and butterfly garden. Beneficiaries come from far and near and the garden has benefited NTU's research efforts. In the not too distant future, there could be a new drug that contributes to less painful and more effective treatment for diseases like cancer -- all from the humble blue butterfly pea flower. In December 2008, in recognition of the benefits to his community, the “938” garden became an official part of the landscape in Jurong West. At the official opening ceremony, Member of Parliament Mr Alvin Yeo cited not only the value of the plants for the community but also the inspiring perseverance of an individual. 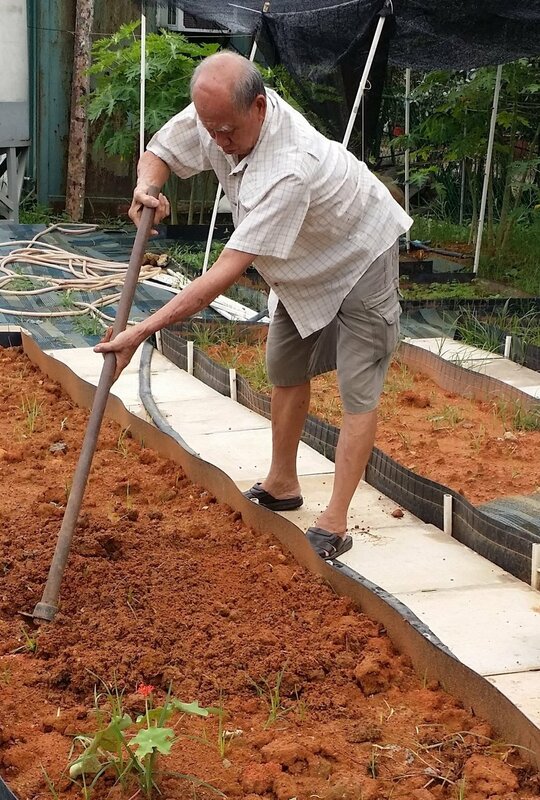 Uncle Tan has received numerous accolades from the community and his garden in Jurong West has several times been awarded Gold and Silver medals by the "Community in Bloom" programme. He was also inducted into the honour roll of the National Park Board’s “Community in Bloom Ambassadors”, in recognition of how he has inspired a love for gardening in many people. Despite being completely independent and not a registered TCM practitioner, his knowledge of plants has attracted the interest of local and foreign universities, and his achievements have been noted in media in Singapore, France, Taiwan and China.